Low valuation and improving profitability are the main reasons I'm optimistic about Bank of America's stock. Bank of America's headquarters in Charlotte, North Carolina. Image source: iStock/Thinkstock. When stocks dove at the beginning of last week, I bought shares of Bank of America (NYSE:BAC). My rationale was fourfold. 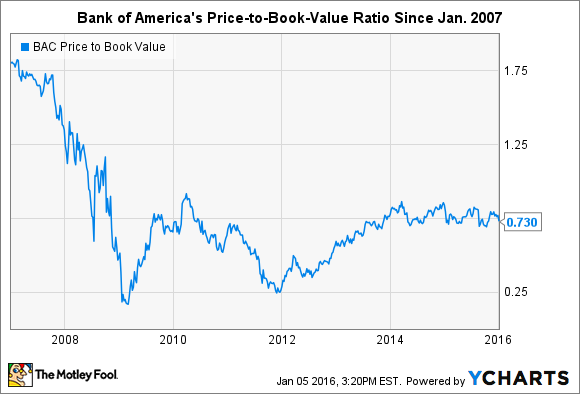 Bank of America is a valuation play. Its shares trade right now for a 27% discount to book value, or roughly in line with its tangible book value (its shareholders' equity less goodwill and other intangible assets). Meanwhile, it isn't unreasonable to think that in good times, shares of the North Carolina-based bank will trade for "two times book," as an old industry adage goes. This is a hunch, not a guarantee. But it's based on my analysis of the way the bank industry has worked since the Civil War, when American banking began to assume its modern shape. Banking is cyclical. It always has been, and at least until compelling evidence proves otherwise, I assume it always will be. This reality can, and at least in my opinion should, be leveraged to buy low and sell high. Bank of America's problems since the financial crisis have revolved around high legal expenses, elevated loan losses (particularly from its credit card portfolio), and nonpermanent expenses associated with servicing subprime mortgages inherited in its 2008 acquisition of Countrywide Financial. A legal opinion in the second quarter of last year time-barred new claims against Bank of America for misrepresenting the quality of mortgages originated by Countrywide and sold to institutional investors. These claims have cost the bank $28 billion -- this excludes fees paid to lawyers and other litigation expenses, which add $35 billion more. But thanks to the legal opinion, Bank of America was able to reduce its estimate of outstanding "representation and warranties" claims by $7.6 billion. The ruling also staunched the inflow of new claims, reducing it from over $2 billion a quarter to just $220 million. The biggest issue in terms of loan losses sprang from Bank of America's pre-crisis strategy to issue credit cards to everyone (and their mothers) with little regard for creditworthiness. "To drive growth, we gave cards to people who couldn't afford them," CEO Brian Moynihan told Fortune's Shawn Tully in 2011. This cost the bank three full years of profits during the best of times, or $60 billion. However, because credit card loans are generally charged off within six months of entering delinquency, the problem had largely been dealt with by the end of 2010. Finally, following in the footsteps of Citigroup, Bank of America set up a separate division (sometimes referred to as its "bad bank") that was tasked with servicing crisis-related toxic and noncore assets, and, eventually, removing them from the bank's balance sheet altogether. At its peak, this unit employed 41,800 fulltime workers. In the latest quarter, meanwhile, this had fallen to 11,000. As this drops further (it should eventually reach zero), so will the excess servicing expenses associated with delinquent loans. Taken together, these three factors explain why Bank of America's profitability has finally started to emerge from under the cloud of the financial crisis. To this end, the third quarter of last year marked the first time since 2008 that the $2.2 trillion bank had reported four consecutive quarters of solid profits. As Bank of America's profit improves, so too will the valuation of its stock. It's long been said that bank investors should "buy at half of book value and sell at two times book." This rule, while imprecise, rings true with Bank of America. Shares of the nation's second biggest bank by assets bottomed out after the crisis at roughly 25% of book value in 2011 (the same year Warren Buffett invested in Bank of America), but they have been on an upward march ever since. This progress should continue, if not accelerate, so long as Bank of America's profits continue to grow. Finally, boosting its dividend and share buybacks should serve as an additional catalyst for Bank of America's stock. Investors have been clamoring for the bank to increase its dividend after the bank reduced its quarterly payout to only a penny a share at the nadir of the crisis. The bank responded last year with a fourfold increase. But while it now pays out $0.05 per share each quarter, that's still a fraction of its potential. If Bank of America can earn 1% on its assets after tax, which seems probable, it will have $22 billion in earnings to dispose of each year. Most of this, according to CEO Moynihan, will be returned to shareholders. And assuming that it allocates a third of this to dividends, which is a standard percentage for banks, it could be paying out $0.20 a share in the not-too-distant future. More importantly, assuming Moynihan is serious about buying back stock, as he intimated to Fortune's Tully in 2011, then shareholders could see the value of their stakes improved further. As William Thorndike covers in his excellent book The Outsiders, the best returns over the past 50 years have been driven in large part by appropriately timed stock buybacks. With Bank of America's still stock trading at a meaningful discount to its book value, every dollar spent on buybacks would, at present rates, increase its book value by $1.37. In sum, while I've been critical of Bank of America in the past, I can't help but think it will indeed succeed at fully and finally recovering from the financial crisis. This could still be a handful of years out, but I'm in no hurry. I bought the stock for my retirement account and plan on holding it for many years.